Want a cost effective way to update your kitchen? Cabinet painting can give you a whole new updated look without breaking the bank! If you are considering replacing your cabinets, wait! If they are in good repair, refinishing them could save thousands of dollars. All City Construction and Remodeling has been refinishing (painting and staining) kitchen and bathroom cabinets since 1999. Make your kitchen and/or bathroom look fresh and new with a coat of paint or refinish with stain for a fraction of the cost of replacing them. 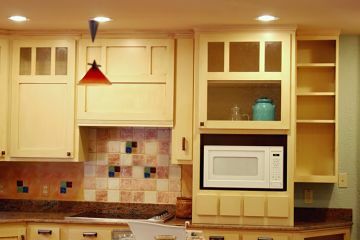 All City Construction and Remodeling offers affordable solutions to kitchen remodeling with our cabinet painting services. You can update your kitchen and achieve the look you want at a reasonable price. Get that new kitchen that you have been dreaming of at a fraction of the price! When you call (310) 504-2231, for cabinet painting, you'll be impressed with our professionalism and quick response. Our goal is to amaze you with how quickly and inexpensively we can complete the job. Add some new curtains on the window and update hardware and you'll have a new kitchen to enjoy! The skilled cabinet painters from All City Construction and Remodeling follow best practices for painted cabinets that will stand the test of time (and wear!). First, we will strip and sand your cabinets to remove old paint. Next, we'll repair any dents or cracks and sand the surface smooth. Once completed, we apply a rich-looking, long lasting paint or stain. The result will be expertly finished cabinets that look great and fit your budget. All City Construction and Remodeling can give those worn cabinets a facelift! Call (310) 504-2231 today to schedule a free quote. Refinishing kitchen cabinets requires skill and attention to detail that All City Construction and Remodeling is well known for. We can refinish cabinets to create the style and color scheme that you’ve always wanted. Has your kitchen become dull and dated? Painting your kitchen cabinets is the #1 way to update your kitchen and save money. Get a new kitchen at a price you can afford. Now is the perfect time for you to rejuvenate the center of your home. Call (310) 504-2231 for a free consultation. All City Construction and Remodeling can also add pizzazz to dull or dated bathroom cabinets. The professional painters at All City Construction and Remodeling are outstanding at bathroom cabinet repainting and staining. Call the experienced cabinet refinishers at All City Construction and Remodeling and watch them use their craftsmanship to transform your bathroom cabinets and enhance their beauty. Your bathroom vanity will look great with a quality finish.